Orchids come from many climates from near arctic to tropical. Most of the types we offer are tropical to subtropical and will be happy with household temperatures between sixty-five and eighty-five degrees Fahrenheit. 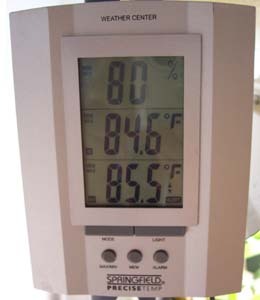 We check temperature and humidity with electronic thermometer/hygrometers that record minimum and maximum readings. Some orchids, particularly Moth orchids, appreciate a nighttime temperature drop of ten to twenty degrees in order to initiate bloom spikes. We open the windows varying amounts most nights throughout the fall and spring to provide this temperature differential. In winter, we usually experience evening temperature drops when the lights turn off anyway; but on warmer winter nights we do crack open the windows slightly. In summer, if the night air is warmer than sixty-five degrees Fahrenheit, we open the air conditioning vent in the green room instead of opening the window. Be cautious with the use of heat and air conditioning in growing areas as they also tend to dry the air. Consider evaporative cooling if your growing space gets above eight-five degrees. Commercial evaporative coolers are available, and simple ones can be made by placing water trays in front of fans as described in the section on air movement. If feasible, a pump sprayer can be filled with cool water, pressurized, and set to spray a fine mist into a corner (not directly onto plants) that will disperse throughout the growing area. This will provide immediate cooling, but may require frequent attention to maintain pressure and for refilling. Mist generators that can be attached to thermostats and/or humidistats are available too. When considering temperature, one needs to keep in mind the elevation of the plant's native habitat. Many tropical orchids grow naturally at high elevations where cool, constantly humid conditions prevail. Masdevallia and Dracula are perfect examples. Almost all of the species of Sophronitis grow in the mountains as well. Identification tags provided with our plants typically indicate the temperature preference of each species or hybrid with the letters W, I, and C as follows: W- warm, winter night temperatures 65° F or warmer, 90° F maximum summer day temperature I- intermediate, winter night temperatures between 55° and 64° F, 85° F maximum summer day temperature C- cool, winter night temperatures between 45° and 54° F, 80° F maximum summer day temperature. Some orchids have a broader temperature tolerance so a range may also be given. Moth orchid tags usually indicate W-I. They thrive in warm temperatures, but may require several weeks in the fall of intermediate nighttime temperatures to initiate winter or spring blooms. Air movement assists in battling high temperatures. If hot air is allowed to remain near leaf surfaces, damage may occur. Use fans to circulate warm air away from leaves. We try to have a gentle breeze in the growing spaces at all times. Try two ordinary box fans blowing directly into opposing corners of the green room. This forces air up along the corners of the room, over the ceiling and gently and fairly evenly down onto the plants. Containers of water with cylindrical humidifier filters in them in front of the fans help increase humidity. Additionally, these water trays seem to cool the room several degrees by evaporative cooling. Air blowing directly on orchids will tend to quickly dry them requiring more frequent watering.